First Line: If it weren't for Jerry Garcia peeing on my pansies, I never would have joined the League of Literary Ladies. Bea Cartwright is new to Put-in-Bay, a small Ohio town on South Bass Island in Lake Erie. She's just spent a lot of money renovating a huge Victorian mansion on the shore into a bed and breakfast. She's sick to death of Chandra Morrisey's cat killing her flowers, while Chandra thinks her fuzz baby can do no wrong. Kate Wilder of Wilder Winery has had it up to here with Chandra's loud music and the constant traffic from Bea's contractors and repairmen. Bea and Chandra would both love to put a sock in Kate's mouth. These three women have made Mayor Alvin Littlejohn's life a living hell-- until the day he learns that the local library is about to lose badly needed funding if a book club dies from lack of interest. Seeing a way out of his misery, a way to save the library, and a possible way to resolve these women's differences, the mayor orders them to form a book club that meets every Monday night for a year. 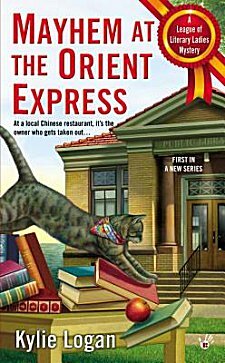 The women drag their feet until Peter Chan, creator of their favorite orange peanut chicken at the Orient Express, is murdered in his restaurant. As the snow from a late spring storm piles up and more and more people seek refuge in Bea's generator-powered Victorian, these book club women-- whose first assigned book is Agatha Christie's Murder on the Orient Express-- decide that the killer could very well be someone at the B&B... and that they should ferret out the killer as quickly as they can. The first part of Mayhem at the Orient Express had me dying to slap Bea, Chandra and Kate silly. Any group of people who bicker amongst themselves constantly makes me head for the hills. Alvin Littlejohn should be given an award, not only for hanging onto the shreds of his sanity, but for devising a way to save the library funding. Fortunately, once the dead man is discovered and the blizzard hits, the three characters calm down and stumble through their investigation. The author has assembled a cast of primary characters that could have a lot of staying power. There's Chandra Morrisey the New Age flake, Kate Wilder the Type A business woman, Luella Zak the practical older owner of a charter fishing company, and Bea Cartwright with her mysterious New York City past. Parts of Bea's past are revealed throughout the book, but there are still plenty of secrets that have yet to see the light of day. It's the set-up for a good cast, all right, but Bea is the only one who really comes to life. Investigating a mystery crammed in a big old house filled with refugees from a blizzard works quite well, adding just the right touch of comedy, claustrophobia, and a hint of romance. It will be interesting to see if Logan develops her characters more as the series progresses. I certainly hope so. Cathy - Sounds like an interesting premise. I admit, I'm most emphatically not one to enjoy bickering either, so I'm not sure I'd like the first part of the novel, but the murder and its investigation sound good. I was definitely sitting on the fence during the first few chapters, but once the murder occurred and snow began to fall, the bickering stopped. Thank heavens!